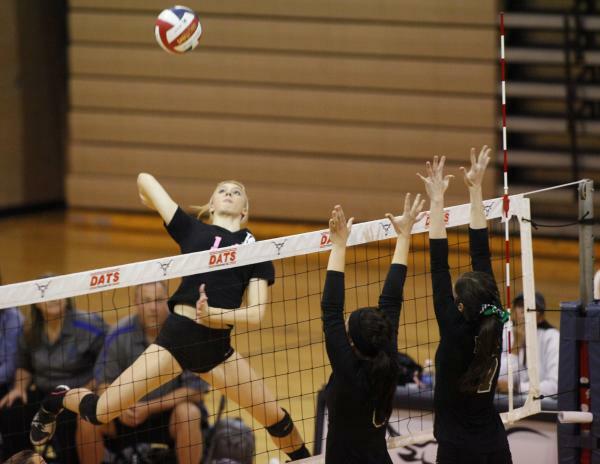 Bishop Gorman's Francesca Manz (14) goes for a spike against Palo Verde during the championship game of the Sunset Region girls volleyball tournament at Legacy on Friday. Bishop Gorman's Gianna Ruggeroli (2) sends the ball over the net against Palo Verde during the championship match of the Sunset Region girls volleyball tournament at Legacy on Fridya. Bishop Gorman has appeared in the girls state volleyball tournament five consecutive years but has yet to win a title. Longtime Gaels coach Ed Van Meetren hopes to flip the script starting at 7:15 p.m. today, when Gorman (29-8) faces Coronado (29-6) in the Division I state tournament at Green Valley. Bishop Manogue (23-5) and Palo Verde (34-4) open the tournament at 5:30 p.m. The winners will meet in the championship game at 4 p.m. Saturday at Green Valley. Van Meetren said his team has the ability to reach the title match, but that it will come down to execution and holding assignments. He said his team’s playoff experience is a big advantage. “They’re extremely confident right now because they’ve been there before,” Van Meetren said. “They know what it takes to get there, and I think that’s an advantage for us. We are familiar with the environment and how things go. Van Meetren hopes to keep getting production from senior outside hitter Gianna Ruggeroli, who has started every varsity match since her freshman year. Ruggeroli had 11 kills and 11 digs in a 3-1 win over Green Valley in the state play-in match. 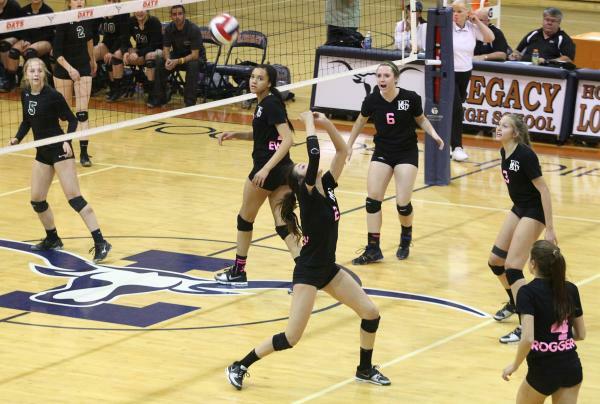 The Gaels fell to Palo Verde 3-1 in the Sunset title match, ending the team’s streak of four consecutive regional titles. Ruggeroli said the Gaels are capable of winning the title. The Gaels will need Ruggeroli and the rest of their talented front line, which includes Utah signee Emma Kirst and Francesca Manz, to continue dominating at the net. “I think we need to focus on putting up a good block and just terminating the ball every time,” Manz said. Van Meetren acknowledged that Coronado is similar to his team.